As a person applying for life insurance, it’s important to understand that there are essentially two different people helping your application get approved: your life insurance agent and the insurance underwriter. The role of the life insurance agent is quite different from the underwriters simply because the agent “should be” working for you! Your life insurance agent’s role is to find the best life insurance option available for you; while the underwriter’s role is to protect the insurance company by minimizing the insurance carrier’s financial risk. Underwriters do this by denying life insurance coverage to higher risk candidates or by recommending higher premiums. 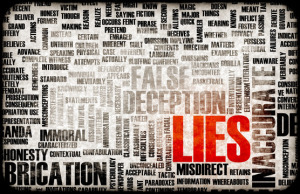 How does this relate to the 10 most common lies told on a life insurance application? That’s an easy one, because when a client isn’t fully aware that their agent is working for them, they may feel that they either need to “leave out” or not “fully explain” a particular condition that may have a serious impact on their life insurance application. And why shouldn’t some life insurance applicants feel this way? After all, if they’ve chosen to apply for life insurance directly with the life insurance company, don’t both the agent and underwriter work for the insurance company? Which is why we at TermLife2Go always recommend working with an independent agency that is not bound to any one life insurance carrier and is free to pick and choose depending on which life insurance carrier is best for you. Which brings us back to the top 10 most common lies told on a life insurance application. Given the much higher premium cost associated with using tobacco, it’s no wonder why applicants will frequently deny using tobacco. And sometimes the applicant doesn’t even realize they are lying. That is because in the life insurance industry, tobacco use applies to “any” use and “all” forms of tobacco—not just cigarettes! So even if you only smoke 1 cigarette a month and don’t “feel” like you’re a real “smoker”, guess what? You are according to the life insurance industry. Or how about someone who has quit smoking but still uses Nicorette gum? Too bad and so sorry — you too would be considered a tobacco user. The reason why is because the insurance companies aren’t looking for “tobacco levels” in one’s system, they’re looking for nicotine levels in one’s system. Now given the obvious financial saving by qualifying for a non-tobacco rate class, life insurance companies are well aware that applicants may try to “under-estimate” their use of any of these products. Which is why they employ the use of very accurate testing procedures, and when available, will also use medical records to uncover possible tobacco usage! Because if you do lie on your insurance application, insurance companies have what is called a “contestability period” which states that within the first 2 years of a policy being put in force, the insurance company has the right to contest any information that you’ve submitted upon your application. Which means that should you pass away within two years of starting your application and you intentionally lied on your application, the insurance company could deny your claim and simply return your paid premium to your family. And the insurance carriers will therefore give clients who use these products a non-tobacco rate class! But not all companies or agencies have such loose guidelines so make sure you choose an agency, life TermLife2Go, that can place you with the best company for tobacco use. Illegal drug use or even use of legal medical marijuana is often something that many life insurance applicants will try to conceal from their life insurance application. These applicants generally believe that as long as there aren’t any drugs in their “system” i.e. in their blood or urine, they’ll be fine. What these same applicants aren’t aware of is that often times insurance carriers can learn about an applicant’s previous or current drug use from many other sources, such as a client’s medical or criminal history. That being said, there are insurance carriers that are relatively lenient when it comes to some legal and illegal drug use but only if it’s disclosed right from the beginning! Lie #3: I only weigh that much after the holidays! You weigh what you weigh, so there’s no reason to lie about it. In fact, even if weight isn’t a problem for you, you might be amazed at how much a few pounds one way or the other can affect the cost of your life insurance when overweight. For this reason, when you decide to apply for life insurance, know exactly what you weigh in the afternoon. This way you can plan to take your medical exam in the morning which should mean that you will weigh a few pounds less than the weight you gave on your application. By doing this you will give yourself the best chance to qualify to the rate that you have been quoted! If you going to travel to a potentially dangerous location or you just love jumping out of airplanes or other such dangerous hobbies, let your life insurance agent know about it right away. The reason is because these types of lifestyle choices could have a significant effect on your life insurance application. So much so that they could even lead to being denied coverage by some life insurance carriers altogether! Don’t think you do anything that would be considered dangerous? Well, how about traveling just south of the border into Mexico? That would be enough to be denied by one of the largest life insurance companies in the world! So even if “you” don’t think something is a big deal, don’t think that the insurance company that you’re applying for life insurance with feels the same way! Lie #5: I’ve never been depressed! The first conversation that you have with your life insurance agent about depression shouldn’t be after the insurance underwriter has ordered and reviewed what is called a “prescription database check”. What’s a prescription database check you ask? A prescription database check is what nearly every traditional term or whole life insurance policy application will require prior to approving ones application. This report will include a list of every prescription medication you’ve ever been prescribed by your doctor. The insurance company will then use this information to determine if it is willing to offer the applicant coverage right away or request additional medical records from the applicants doctors prior to making a final decision. This can delay underwriting as the carrier is now waiting on a physician statement that explains your medication history. Now the reason why you shouldn’t be discussing depression with you agent for the first time after this report has been ordered is because there are certain insurance companies that are much more lenient with depression than others. So do yourself a favor and let your agent know if you’ve ever been diagnosed for depression or ever been given medication to treat depression. That way your agent can place you with the most depression friendly carrier available. By doing so you could be saving yourself thousands of dollars over the life of your insurance policy! Having one DUI 10 years ago is not a big deal when it comes to getting life insurance. But having one 10 months ago could be, especially if it’s your second or third! For this reason, it’s important to let your life insurance agent know right away if you have any DUI’s on your record. After all, the insurance companies are going to order a motor vehicle record report so it’s not like keeping it a secret will really work! All it will do is prevent your life insurance agent from selecting one of the few DUI friendly life insurance carriers that will be more forgiving than most when it comes to recent DUIs and multiple DUIs. Again, the insurance companies will order a motor vehicle report which will outline any tickets or accidents that you have on your record. So be honest right from the start! This way you’re agent will be able to recommend the life insurance best suited for your situation. Having a lot of parking tickets might not be an issue. However, multiple speeding tickets are a red alert to a life insurance company that you might be a reckless driver. Once again, some companies are more lenient than others in this area, therefore admit it up front so your agent can place you with the best company available. In the life insurance world, there really aren’t any “gray” areas when it comes to being diabetic. You either are or you’re not. And once you’ve been diagnosed, you’re going to be considered diabetic for life. So, who is considered a diabetic in the life insurance world? Anyone that has been prescribed medication to treat diabetes (with the exception of gestational diabetes). And anyone with an A1C blood sugar level above 7.0. If this describes you, guess what… insurance companies are going to consider you a diabetic. Now the trick is knowing which insurance companies cater to diabetic cases and which ones don’t. We work with the most favorable life insurance companies for diabetics. Therefore, we can get you the best price possible for diabetic life insurance. Lie #9: Nobody in my family ever gets sick! Now if your agent knows about your family history from the start, he or she can guide you towards those life insurance carriers that may not consider a family history of cancer, heart disease or stroke in their underwriting process. Lie #10: Yes, I make $100,000 a year delivering newspapers! Life insurance policies are designed to “indemnify” the injured party at the time of loss. Definition: Indemnify – compensate one from harm or loss. So your life insurance policy, when in place, should be able to protect your family in the event of your death up to the dollar amount that they would suffer financially due to your death. Insurance companies don’t want to insure an individual above and beyond this calculated value. For this reason, insurance companies have designed and put in place safeguards to protect themselves from “over insuring” any one individual. So if your 60 years old and earn $30,000 dollars you’ll probably have a hard time qualifying for a $2,000,000 dollar life insurance policy even if you were fine paying for it. This is because the insurance company doesn’t want to make you worth “more dead than alive”. Because of this, people will often exaggerate how much they earn so that they can then qualify for a much larger life insurance policy. The only problem with this is that beyond it being obvious fraud, it may also open up the application to added scrutiny by the underwriter making it even more difficult to get approved at any level. In cases like these, if the amount being applied for is justified and makes sense, underwriters will typically find a way. However, unless the applicant is honest from the beginning, these types of cases will usually be denied right from the get go! So Don’t Lie on Your Insurance Application! Now if you’ve made it this far, we here at TermLife2Go would just like to just leave you with these three pieces of advice that should help you find the life insurance coverage that your looking for. Don’t lie on your life insurance application; it’s never worth the risk. Find an independent life insurance agent that you can trust and that is going to work for you not the insurance carriers. Discuss your life insurance goals with your agent and answer his or her questions to the best of your ability so that they can use your answers to find the right life insurance carrier for you! TermLife2go is an agency that works with dozens of top rated life insurance and no medical exam companies. Our #1 priority is to find you the best company at the best price…for you! That means we tailor a policy specifically to you because no two clients are alike. TermLife2Go does not favor any one life insurance company over another. Instead, we find out what you need and then we recommend the lowest priced, best life insurance company to meet your specific need. We’re looking for customers for life who will not only be completely satisfied with our services but also gladly tell their friends and family that TermLife2go is the only life insurance agency you need to call. What if someone self-employed misrepresents his income because he believes that he will make more in the coming years. If he passes away after the contestability period, can the companies still deny the payout because his income was falsified? Would the payout be readjusted to his actual income? Or would the full policy value be paid? Please call one of our licensed agents at (888) 234-8376 to discuss in detail. Thanks but you didn’t answer the question. No help! Each life insurance company will generally have it’s own cut off dates for when you can and can not convert a term life insurance policy into a whole life insurance policy. Additionally some insurance companies don’t even offer this option. This is why it would be totally irresponsible for us to speculate on your situation or just throw out a arbitrary “age” in response to your question. I have had a term life policy since I was 32 years old and now I’m 58. Not sure at what age it will expire but generally speaking at what age is the cut off for converting it to a whole life policy? Our advice would be to first contact the insurance company that you currently have a policy with and fine out what options you may or may not have with them. Then give us a call, and see if we might not be able to provide you with a better option. Let me explain better- when I applied for the whole life policy with Banner Life, they asked me questions. Yes the questions you said they’d ask. Then wanted me to sign a consent form so they could access my medical records, etc. Before signing I asked them to disclose the extent of their inquiry. The only thing they disclosed the MIB report. No mention of the prescription data base which by the way most Americans don’t even know exists and was purposely kept a “secret” for years. So imagine my surprise to find out there was much more inquiring done than they disclosed to me. It’s all about discloser. Discloser, discloser, discloser. That’s all. If I have to disclose my information, they should have to disclose the extent of their queries. Now we better understand you’re question. It sounds like your agent should have better “prepped” you for what happens once an application goes into underwriting. That being said, we think you’ll find that in the “language of the application”, you will see that the insurance company will disclose what they may inquire about during the application process which is why it’s routine for them to simply order a “prescription database check” right away. Lastly would also agree with you, that the insurance industry, as a whole, could benefit greatly by increasing the ease and transparency of the application process and should do a better job in general, in explaining exactly what they do and don’t look for in an applicant! Thank you for the reply but let’s say there nothing at the MIB and nothing in the prescription data base plus a clean driving record and good credit report. How much digging will they do? Will they contact local hospitals to see “if” an applicant has visited the ER, etc.? Also what about diagnostic labs? Blood tests? Are results kept in a data base (or something) for insurance underwriters to access? And lastly, when applying for life insurance and surrendering HIPPA rights, and in the spirit of “full disclosure” would it be reasonable to make a full disclosure request regarding all searches and inquires done on an applicant. I mean they’re going to want to do these searches but there are HIPPA laws so a consent is given but before consent is given could an applicant request full disclosure of ALL potential inquiries? You’re going to be asked a ton of questions about your health and most life insurance applications will specifically if you’ve been to a hospital for the last two years. Our advise it always to be as honest as possible during a life insurance application, because its good advice and because there is a “contestability clause” to most if not all life insurance policies that states that if you intentionally misrepresent yourself or your health on a life insurance application, the insurance company can decide later on not to “honor” the actual policy. Based on your questions, and the article you’re reading, it “appears” as though you have information that you’re aware of that could potentially affect the outcome of your life insurance application, and now you’re wondering if you don’t “need” to disclose it. In our experience, full disclosure is always the best policy. Do underwriters search medical facilities such as local hospitals for medical information about an applicant? During a typical life insurance application, insurance underwriters will first utilize two different services that will go a long way in helping them make a decision on who they do and don’t want to insurance (and at what price). The first service is simply running a “prescription data base check”. Now it’s possible that an insurance company may in fact request a copy of your “actual” medical records, but they don’t necessarily need to order these to learn that you may or may not have a pre-existing condition. For example, if you’ve been prescribed Metformin, a common medication to treat diabetes, the insurance companies aren’t going to need to do much more research on you to determine that you have been diagnosed with diabetes. The second service that most insurance companies will utilize is the Medical Information Bureau or MIB. This is a service that insurance companies subscribe to that keeps “general” records about previous life insurance applications. So… if you’ve been denied coverage from one insurance company for some type of pre-existing condition, while that condition won’t be listed in the MIB, a record of your denial will be. This denial will then be used by other insurance companies as a potential “red flag” regarding a current application, which will often lead them to do additional research prior to making any type of underwriting decision. Is an underwriter able to get medical and other information that was given to another underwriter on a previous application process? Even if it was from a different underwriter company? From the article that you were reading when you asked this question, it sounds like you’ve recently been denied life insurance and you’re wondering if you may have a chance at getting approved for life insurance if you try applying with a different insurance company. •	If you feel that there was something in your medical records or medical exam that prevented you from getting insured, it would be important NOT to hide this information or NOT disclose this information to the next insurance company. Failing to do so COULD allow the insurance company to POTENTIALLY reject the validity of the life insurance policy later on, if warranted. Within the life insurance industry, there is something that is called the Medical Information Bureau (MIB). The MIB collects data on most, if not all life insurance applications collected by the “major” life insurance companies out there. For the insurance companies, the MIB is an essential part of the underwriting process, because it helps them protect themselves from people simply applying for life insurance over and over with different life insurance carriers. Person says they are not a smoker, yet on their life insurance medical exam they test positive for nicotine. Person then waits 30 days and applies again with a different life insurance company, once again stating that they are a non-smoker. In this case, the MIB would prevent the applicant getting a “non-smoking” rate because within the MIB, there would be a record of this applicant “qualifying for a tobacco rate with company X”. Now notice how we say that this applicant would qualify for a “tobacco rate with company X”. The MIB does not share medical information, it only shares results. Now in the example of our smoker who doesn’t want to get a tobacco rate, it’s pretty easy to extrapolate why the person is choosing to apply again. But what about when someone is simply denied coverage? Within the MIB it will only say that: “MR. X was denied coverage by Company X on such and such a date”. It will not go into detail on why MR. X was denied. Which means that if the new company is looking at your application and isn’t able to determine why the previous company chose to deny your application, there is a very good chance that the new insurance company will simply “error” on the side of caution and also choose not to offer coverage. Well it could be because there are a lot of medical conditions and life style choices (sky divers, bungee jumpers, rock climbers etc) that may be denied by one life insurance company but not by another one. So if you decide to play it “safe” and not mention why one insurance company decided to decline your application, not only could you potentially risk the validity of the policy should you manage to “fool” the next insurance company, you could also be setting yourself up for failure once again. Don’t be, just give us a call, be honest about what’s happened in the past, and we’ll do our best to help you out. Without knowing more it would be impossible for us to say which option would be best for you. What we can say is that for the vast majority of our clients, term life insurance policies are “generally” a better fit. Why don’t you just give us a call when you have a chance and we’ll take a look at all of your options. Previous Post: The Ladder Strategy for Life Insurance: Is It Right for You?